Cranberry sauce–I’m sure for some those words are enough to make you crawl out of your skin, especially the canned part. Yes, I’m talking about that congealed jelly log that seems to wiggle on the plate for at least a minute after being released prisoner from the can. I personally love the fact that canned cranberry sauce comes complete with easy to follow cutting lines, those signature can scars. Don’t those can scars make a statement on the holiday table? My family is notorious for bringing extra cans of cranberry sauce out of the fear that I will not have any on hand. Cans come, cans go, some going home with relatives, some going into my pantry. I happen to love canned cranberry sauce or maybe it is just the tradition of it on the Thanksgiving table. 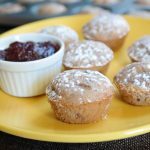 The jellied glob of canned cranberry sauce, however, never touches my hubby’s plate, unless it is in Cranberry and Apple Pork Chops or concealed in these muffins. Cream butter and sugar together until light and fluffy. Add egg and lemon juice. Beat until smooth. In a separate bowl, sift together flour, baking powder, and salt. Add to butter mixture. Cut in pieces of cranberry sauce. Gently incorporate. Fold in nuts and coconut. 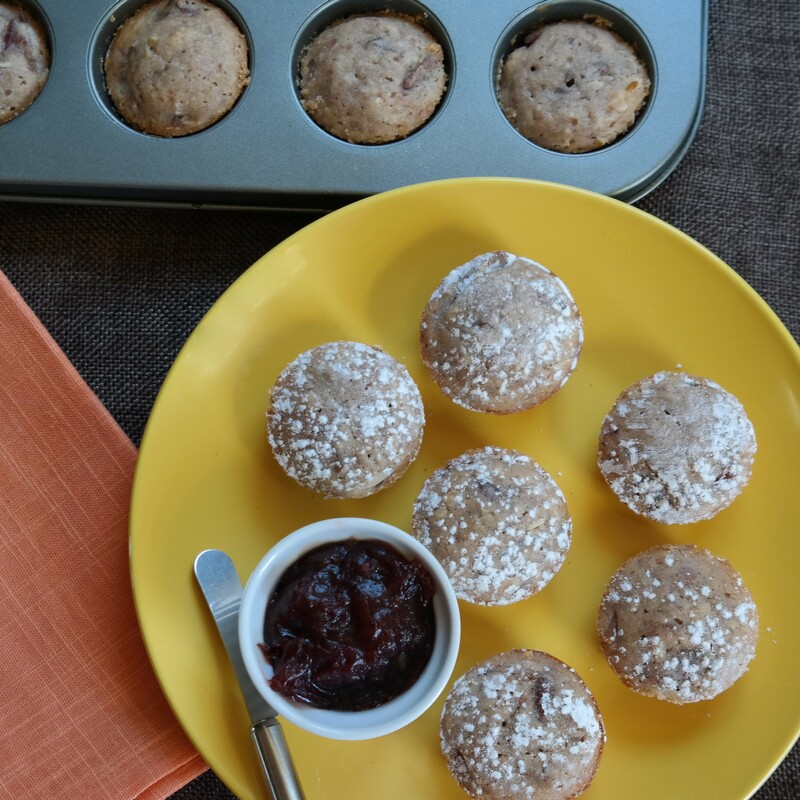 Put batter by tablespoons into a non-stick mini muffin pan. Bake for 20 minutes until tops spring back. Remove and top with powdered sugar, if desired. Put your TO COOK IS TO CREATE thinking cap on: Have any baking chocolate or chocolate chips? 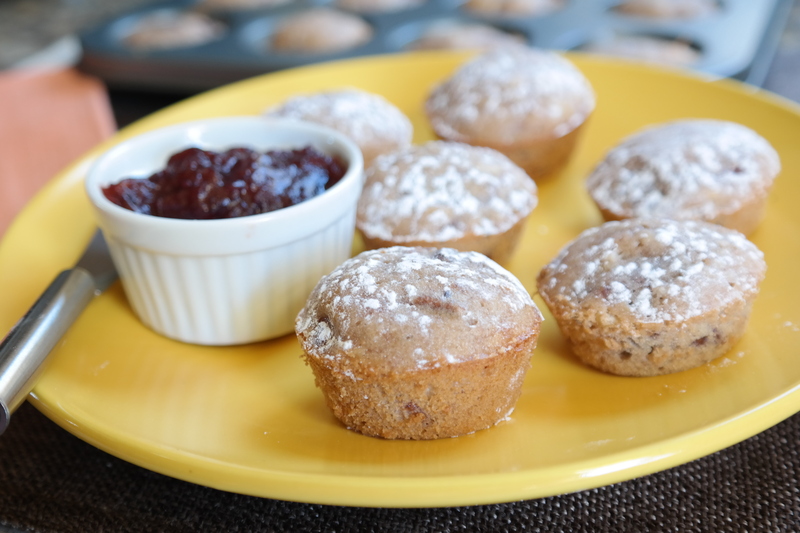 Mix in the chips before baking or melt chocolate and drizzle on top of cooked muffins. Like to spice things up? Add 1/2-1 teaspoon your favorite spice-cinnamon, ginger, nutmeg, allspice. Like it zesty? Add orange or lemon zest. Not a coconut lover? Just omit it. What else could you add? Poppy seeds? Dried fruit? What kinds of nuts will you use-pecans, walnuts, pistachios, almonds, macadamia? Still have some leftover cranberry sauce? Make a glaze-Melt cranberry sauce in a saucepan over medium heat, stir in orange juice, then whisk in powdered sugar until desired thickness (or sweetness!). FOOD FUN: Have relatives staying over for a few days? Gather the family around in the kitchen and make a batch of these chewy coconut cranberry muffins and share. Share time, share memories, share laughter, share life. No relatives? Share with a neighbor. The wise Julia Child said, “It’s fun to get together and have something good to eat at least once a day. That’s what human life is all about-enjoying things.” Stop and enjoy the holidays. How delicious indeed! Looking forward to sampling some of these goodies. Love the taste of cranberry sauce. Scrumptious recipe!